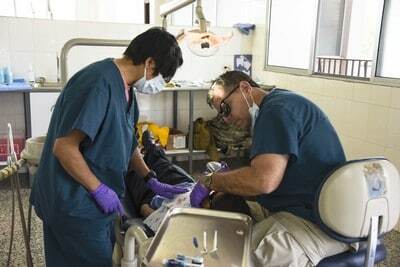 Tegucigalpa, Honduras, Oct. 2, 2018 —The U.S. Army Regional Health Command Central (RHC-C) deployed a Multi-Specialty Surgical Dental team to work with Joint Task Force Bravo Medical Element (MEDEL) personnel at the Catholic University Dental School in Tegucigalpa, Honduras, from the 2nd to the 14th of September, and provided pediatric dental services to school children while enhancing their mission readiness skills and providing humanitarian assistance. The mission has been taking place in Honduras yearly since 2001 and was developed from a MEDEL initiative; intended to preserve first molars among children in remote communities that were visited during Medical Readiness Training Exercises. This 17 year old mission’s top priority is to prepare service members in the military decision making process by deploying to an unknown environment and completing a mission successfully. “We first address readiness by taking a senior noncommissioned officer and an officer in charge and making them go through the steps of the military decision making process; ordering supplies, going through the logistics of shipping, securing the location, and then bringing a team here to establish a clinic, which is something most have not experienced before. So the mission is multifaceted in the sense that we not only consider the pediatric patients but also the location,” said Maj. Jennette O’Bryhim, periodontist and officer in charge for the RHC-C mission. These exercises are highly beneficial to participating service members, which include periodontists, dentist, dental hygienists and dental assistants, by helping them prepare for the unknown or a potential humanitarian assistance and disaster relief operation. “They learn to work with supplies that they may not be familiar with or a lack of supplies, and then they treat a level of decay that you do not find traditionally in your dental facilities in the United States, so we gain readiness in several different ways,” said O’Bryhim. “The Army invests a lot to train their officers in the military decision making process and this is how we implement that process”. Patients received specialized care such as restorations, pit and fissure sealants, dental prophylaxis and limited minor surgeries; all services that they otherwise might not have access to in their communities. “We wanted to see what kind of assistance the children in the areas where we have projects in could get. These children have very limited resources and many of them come from conflictive areas. Save the Children works in areas with high rates of violence, gang activity or drug trafficking and many of them have a hard time leaving those areas; whether it is from fear or a lack of resources to do so. So to be able to bring them here to get these services is very important,” said Pamela Pinel, Save the Children representative. Many of the children are seeing a dentist for the first time and the greatest appreciation from the Honduran Ministry of Health comes from the excellent care and patience that the US military personnel have when providing care for the children; making them feel at ease and less apprehensive to follow up consultations provided by the MOH. The dental staff creates trust among the children by utilizing helpful tools to educate them on oral hygiene and allowing them to familiarize with the equipment that will be used prior to their consultation. During the two week specialty exercise 178 children from three different schools in Tegucigalpa were able to receive care with coordination from the MOH, the Honduran Red Cross who provided transportation from each school to the mission location; the Honduran Army who provided security for the medical personnel and the children; and Save the Children. “It has been very rewarding and I am grateful to be in the Army and a part of this mission. I think that there is no greater joy than leading a team successfully and as a consequence of that success we were able to enhance the lives of children,” said O’Bryhim. During the two week Army South funded exercise, the RHC-C deployed team also improved their leadership abilities, professional skills and resilience, preparing them to deploy and accomplish clinical critical tasks in any environment.